We do not often see fresh clams in a Southern landlocked state. When it happens, I tend to buy everything available. A kindhearted soul would probably leave some for another to enjoy, but they probably live somewhere by the ocean where clams are plentiful. In a large saute pan heat olive oil over medium high heat. Add garlic, basil and cayenne pepper and saute until fragrant, about a minute. Add clams and wine bring to a boil and cover. Cook for 10 minutes without touching pan. Uncover and discard any clams that did not open. Add chicken stock and bring to a heavy simmer. Cook uncovered for another five to seven minutes. 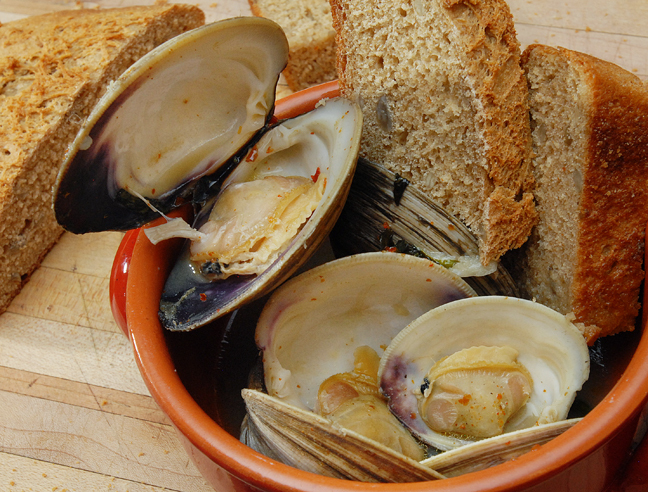 Serve clams in bowls swimming in sauce with bread to dip. This entry was posted in Appetizers, Food, Italian, Recipes, Seafood and tagged fish, healthy, shellfish, steamers. Bookmark the permalink. Love clams like this and am lucky to be able to get hold of them quite easily….mmm now I fancy “spaghetti alle vongole”! A fantastic way to showcase the beautiful flavours, simply.